Photo by Hillary Sanctuary, Ecole Polytechnique Federale de Lausanne. Researchers with the Ecole Polytechnique Federale de Lausanne in Switzerland discovered that a planetary “embryo” whose size was between Mercury to Mars gave origin to the meteorite fragments that form the Almahata Sitta collection. The pieces were recovered from the Nubian Desert in Sudan a decade ago. 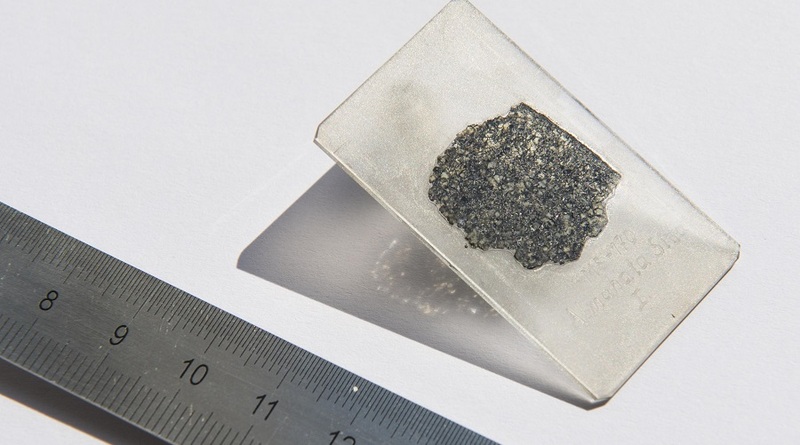 Such fragments contained diamonds of some 100-microns in diameter and have been objects of study since the asteroid “2008 TC3” entered Earth and exploded on October 7, 2008. The gems allowed the scientists to reach their conclusion regarding the unborn planet. The fact that the Almahata Sitta meteorites were mostly ureilites, a rare type of stony meteorite that often contains clusters of nano-sized diamonds, was the clue that led them to sift through the many possibilities in terms of their own origin. 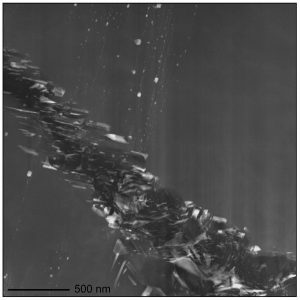 “Current thinking is that these diamonds can form in three ways: enormous pressure shockwaves from high-energy collisions between the meteorite ‘parent body’ and other space objects; deposition by chemical vapor; or, finally, the ‘normal’ static pressure inside the parent body, like most diamonds on Earth,” a university press release reads. A colorized image shows the diamond phase (blue), inclusions (yellow) and the graphite region. Photo by Earth and Planetary Science Laboratory, Ecole Polytechnique Federale de Lausanne. To determine which of the three possibilities was the most feasible, the researchers studied the diamond samples using a combination of advanced transmission electron microscopy techniques. The analysis of the data showed that the diamonds had chromite, phosphate, and iron-nickel sulfides embedded in them, inclusions that have been known for a long time to exist inside Earth’s diamonds but are now described for the first time in an extraterrestrial body. This means that option three was the winner. “The particular composition and morphology of these materials can only be explained if the pressure under which the diamonds were formed was higher than 20 GPa (giga-Pascals, the unit of pressure). This level of internal pressure can only be explained if the planetary parent body was a Mercury- to Mars-sized planetary ‘embryo,’ depending on the layer in which the diamonds were formed,” the brief states.